Owning a home staging business, I often feel the heavy weight of expectations from myself and others that my own house would show like a model and be expertly decorated for every season around the calendar! The truth is, much like many of you, our family is busy and it’s just not possible. 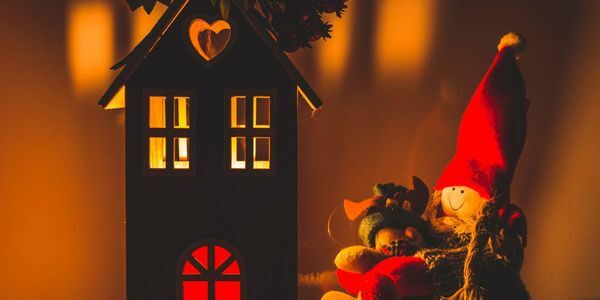 If you feel like me, perhaps some of these tips can help you get through the process a little more stress-free and focus on the joy of the season! Know Your Limits – Think about what it is in the holiday decorating process that stresses you out the most. If the thought of stringing lights from your gutters makes you want to stick a fork in your eye, hire it out! If you procrastinate wrapping all those gifts because you’d sooner walk on hot coals, designate it to your crafty teen or a professional wrapping service. Consider simple catering or potluck for your holiday parties. Enlist friends or a professional holiday decorating service to assist with décor. Call a family meeting, list the extra duties that the holidays entail and delegate! I am constantly telling our staging clients that “the way you live in your home and the way you sell your home are two entirely different things!” Your home should reflect you and your family’s life and experiences. Decorating for the holidays should be no different! I, right now, give you permission to step away from your holiday Pinterest page, look around your home, make it simple and USE WHAT YOU HAVE! Focus on your front door, the tree and your mantle or other focal point in your home. Take care of yourself! It is flu and cold season. A stressed-out body can result in a compromised immune system that the flu is just waiting to attack! Be sure to stay on your same rest and exercise routine. Sometimes we need a reminder about what the holidays are all about. Spend a moment and figure our what the holidays REALLY mean to you and your family. Ask them what’s really important to accomplish or do and SCHEDULE some family down time! Simplify! Is it necessary to get out the fine china that results in more dishwashing? Does every package need to be perfectly wrapped when you are just going to rip them open in a few short days? Do you really need to bake 17 different kinds of treats when you could pick them up at the grocery store? I drive myself nuts every year trying to be sure I get Christmas cards in the mail by an acceptable date. Then, when I receive a card before I’ve been able to send my own out, I am wondering why I can’t get my act together sooner. Sound familiar? Lastly, focus on the fun of the holidays and TRY to remember that you don’t have to do it all!